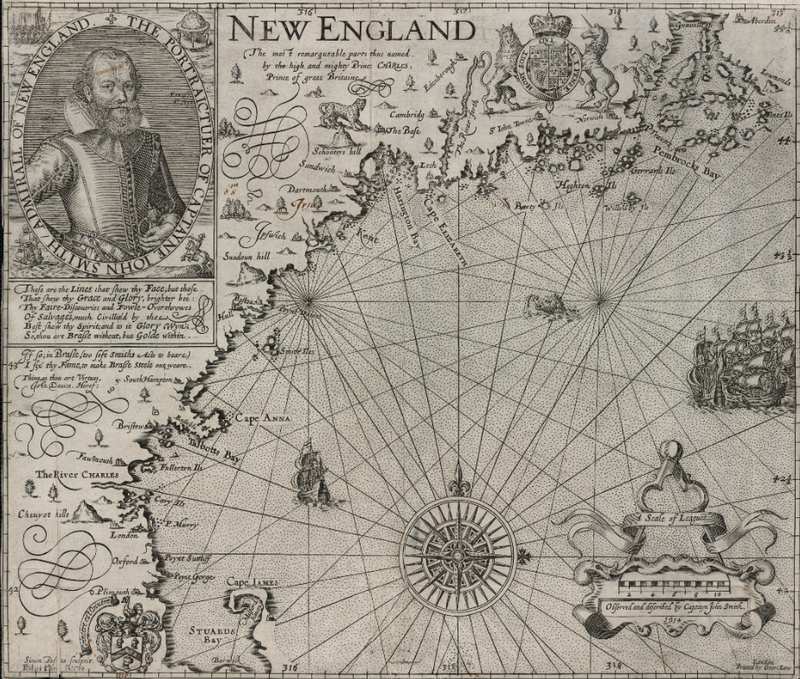 Captain John Smith (1580-1631) gave "New England" its name mapping the coast line from Penobscot Bay to Cape Cod in 1614. A return voyage the following year came up short when he was captured by French pirates and detained for several months near the Azores before escaping and making his way back to England. His book is a tale of these two voyages. His Description of New England describes the fishing, soils, inhabitants, fauna, flora, and climate of the coastal region from Cape Cod to Penobscot. This work is the first to apply the term “New England” to that portion of the North America from Long Island Sound to Newfoundland. At that time it held a few trading and fishing stations, and French traders from the north and Dutch from the south carried on commerce in furs with the natives. There was a prosperous fishery to the north, where cod were taken by ships from Portugal, Holland, and Spain. To Smith, these were evidence of the richness of commodities to be had, and signs of the strategic importance to England of securing permanent settlements in the region. 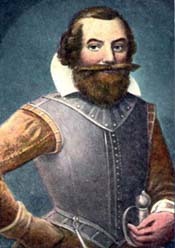 Smith had departed Virginia in 1609 under a cloud of accusations and had quarrelled with the leaders of the privately-held Virginia Company. Seeking a new arena for colonial opportunities in the new world, Smith saw New England as a place where English life could be transplanted to America, and this work is an extended advertisement and prospectus for investors and settlers, with Smith to provide the expertise and leadership. "For 400 years now, John Smith's reputation has risen and fallen on the relentlessly fickle seas of history. He's been lampooned on the Elizabethan stage, skewered by critics as a braggart and a liar, cast in bronze on the shores of the James River..." click to read more. "Smith planned to return and plant a colony here – right here. At least New Hampshire historians like to believe that Smith was headed back to the Piscataqua region or nearby when his elaborate plans fell to pieces. Why else, they claim, would he name the Isles of Shoals “Smythe Isles?...” Click to read more.